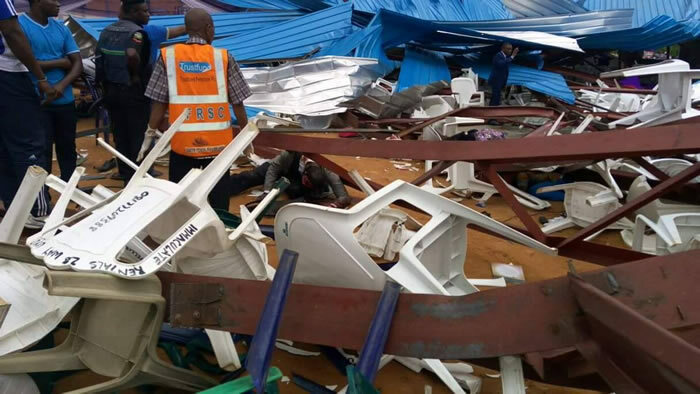 Mortuaries overflowed with bodies Sunday from a church collapse in southern Nigeria that killed at least 160 people, and worshippers said construction of the building had been rushed. 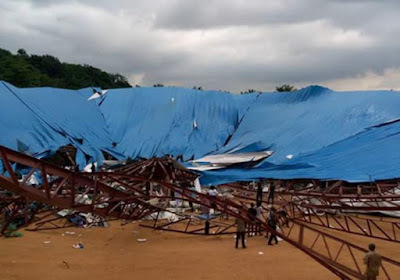 Hundreds had been inside the Reigners Bible Church International in the city of Uyo on Saturday for the consecration of founder Akan Weeks as its bishop when the metal girders fell and the corrugated iron roof caved in. “There were trapped bodies, parts of bodies, blood all over the place and people’s handbags and shoes scattered,” said computer analyst Ukeme Eyibio. Officials feared the death toll could rise. Weeks and Akwa Ibom state Gov. Udom Emmanuel were among the survivors. Eyibio had parked his car outside the complex to make a phone call when he heard a deafening crash and saw that the church had disappeared. He and three others dragged 10 injured people from an overflow area for worshippers just outside the collapsed church. They did not enter the main structure because a construction worker warned it was not safe. The worker called his boss at Julius Berger construction company, which sent a crane to help lift debris off bodies. While they waited for the crane, Eyibio helped a man whose legs were trapped under a girder. “I rushed to my car, got out the tire jack and used that to get the beam off his legs,” the 27-year-old said by telephone. Mortuaries in Uyo were overwhelmed by the disaster, medical director Etete Peters of the University of Uyo Teaching Hospital told The Associated Press. Many of the dead were taken to private mortuaries scattered across the city, said youth leader Edikan Peters. Some people were taking the bodies of relatives to their homes because of the overcrowding. Peters said he counted 90 bodies removed from the church before he was stold to stop his tally Saturday night. Journalists also said that church officials sought to prevent them from documenting the tragedy, trying to seize cameras and forcing some to leave the area. The church had been still under construction and workers had been rushing to finish it in time for Saturday’s ceremony, congregants said. The governor’s spokesman, Ekerete Udoh, said the state government will investigate if any building standards were compromised. In 2014, 116 people died when a multistory guesthouse of the Synagogue Church of All Nations collapsed in Lagos, Nigeria’s largest city. Most victims were visiting South African followers of the megachurch’s influential founder T.B. Joshua. Two structural engineers, Joshua and church trustees were accused of criminal negligence and involuntary manslaughter after a coroner found the building collapsed from structural failures caused by design and detailing errors. Efforts to bring them to court have been foiled by repeated legal challenges.